One of the sessions that I attended at CAST2016 was titled "How do I reach the congregation when I'm preaching to the choir?" presented by Rob Bowyer and Erik Davis. One of the main themes of discussion focused on whether people should "sell" professional development to their colleagues or team. In the introduction to the session, Rob and Erik spoke a little bit about their own contexts. They shared some of the challenges that they've encountered in trying to foster a culture of professional development in both their organisations and their local testing community. Two particular challenges stuck out for me and I noted them down. Firstly, that "most of the people didn't care" about professional development. Secondly, that "I've been struggling to get people to see the value" in professional development. It struck me that these two challenges in creating a culture of learning could be related. I have an ISTQB Foundation certificate. I did this early in my career because I believed that getting this qualification was necessary to find employment in the software testing field. I could see the certificate being mentioned in a lot of job advertisements for testers. I saw a clear benefit to me in downloading the syllabus, doing some independent study and taking an exam. This activity was going to open up opportunities in a field of work that I might otherwise be unable to enter. I wanted to be a tester, so I wanted to get the certification. At that time, I saw the value in this professional development for my career. On the other hand, I have never completed the BBST Foundation course. I have heard a lot about this qualification and investigated the material that is available online. I have advocated for people in my team to attend this course and published the business benefits I used to argue for this opportunity. But I have not completed the course personally. I did not learn about BBST Foundation until I had reached a point where I had learned many, but not all, of the concepts in the course via other means. I had heard a lot about the time investment required to complete the course successfully. When given the opportunity to take the class, I decided not to. At that time, I did not see the value in this professional development for my career. In the case of ISTQB, a manager might have assumed by my actions that I cared about my professional development. In the case of BBST, a manager might have assumed by my actions that I did not care about my professional development. Both conclusions are reached by assumptions, which are present in any communication. The Satir Interaction Model describes what happens inside of us as we communicate - the process we go through as we take in information, interpret it, and decide how to respond [Ref]. 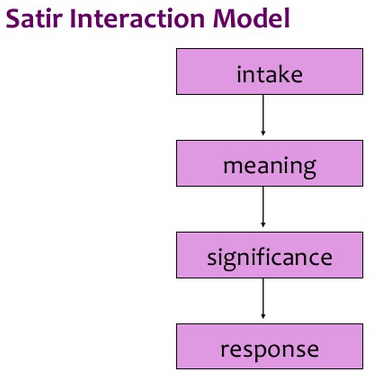 The steps in the Satir Interaction Model between intake and response are hidden. This means that the end result of the process that assigns meaning and significance can be quite surprising to the recipient, which can be a catalyst for conflict. For example, imagine that I give a manager an input of "I do not want to take the BBST Foundation course". I would be surprised by a response from that manager expressing disappointment that I don't care about my professional development. We can also climb a Ladder of Inference in our interactions, which refers the idea that there's "a common mental pathway of increasing abstraction, often leading to misguided beliefs". In essence, this is about leaping to conclusions. For example, imagine the same manager who received my negative response to the BBST Foundation course receiving a promotional email for the RST course. They might extrapolate from my previous negative response that I will not want to attend RST, that I don't want to take any training courses, and that it would be a waste of time to forward me an email that describes this opportunity. I haven't had any input into this flow of reasoning. The manager has independently climbed a ladder of inference. I think we need to be aware of both of these communication models when assessing an apparent lack of interest in professional development - particularly when we're labeling what we see as "most of the people didn't care". Let's return to the question of whether there is a need to sell professional development. I don't think so. However, I agree with an alternative phrasing suggested in the session: that we should foster professional development. When I sell, I am trying to be persuasive and articulate the merits of an activity. My communication is broadcast oriented. I want to share my reasoning and rationale. I try to explain why people should participate. My intent is to advertise. That "I've been struggling to get people to see the value" is a failure to sell. When I foster, I am seeking to encourage the development of an activity through understanding the obstacles that prevent it from happening. I want to be mindful of the ladder of inference and the judgments that I am applying to the responses of my colleagues and team. I want to be aware of where I've assigned significance and meaning might have distorted the message that I have been given, particularly when people are saying "no" to an opportunity. That "most of the people didn't care" is a failure to foster. I believe that there are relatively few people who truly don't care about their professional development. If there are people around you who you would label in this manner, I'd challenge you to think about how you have communicated and the responses that you've received. What have they actually said? What meaning have you prescribed? Have you really understood? I believe that in reflection and inquiry there is opportunity to successfully foster professional development.